The Lewis Railroad Hotel served African American railroad workers in the early 20th century as a boarding house after the Atchison, Topeka and Santa Fe Railway Company extended its tracks through San Augustine. 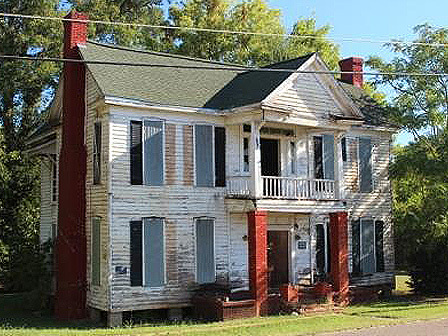 The circa 1870 building is one of the few remaining traces of the economic opportunities seized by African Americans in the face of segregation. The hotel not only provided a safe haven for black travelers through the area, but also served as a home for black men working on the railroad. The Lewis Railroad Hotel has been vacant for approximately 25 years. In 2001, the City of San Augustine with support from prominent Texas foundations and local community-based organizations initiated a restoration project with the purchase and stabilization of the hotel. But shortly after adding a new roof, the project stalled. The expansion of the oil and gas business in San Augustine is impacting the character of the community and there is a risk that this part of the story of the African American experience in San Augustine will be lost to new development. By calling attention to the Lewis Hotel, Preservation Texas hopes that restoration efforts will once again be focused on this tangible reminder of San Augustine’s and East Texas’ African-American heritage.